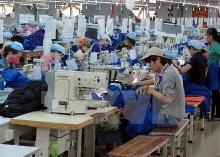 (VEN) - Thai Binh provincial People's committee recently issued regulations on investment incentives in some industries and services in the province until 2020 with many preferential treatments given to craft villages. (VEN) - Existing tax and fees have caused difficulties for small hydropower plants with a capacity of less than 30MW. However, the Ministry of Industry and Trade recently announced Circular 32/TT-BCT with new regulations which are expected to resolve these issues. (VEN) - According to statistics of the Agency for Regional Industry Development (ARID) under the Ministry of Industry and Trade, in the first nine months of this year, industry promotion in the southern region has organized vocational training for 2,984 laborers, built 20 technical demonstration models, assisted 620 rural industrial facilities to participate in exhibitions and trade fairs and supported to establish 20 enterprises. (VEN) - Born in La Thap Tay Village, Duy Hoa Commune, Duy Xuyen District, Quang Nam Province well known for My Son Sanctuary and unique Cham culture, Nguyen Qua has had a special passion for Cham pottery products since childhood. (VEN) - On November 8, 2012, Deputy Prime Minister Hoang Trung Hai signed Decision 1670/QD-TTg to approve the smart power grid development project in Vietnam. This was an important legal foundation for Vietnam and Hanoi energy sector in particular to build investment projects and programs that would help the city meet the demand for sufficient, stable and reliable electricity supplies to serve the local resident’s daily and production activities. (VEN) - According to Hai Phong City's Industry Promotion and Development Consultancy Center, in 2015 the city’s industry promotion funding plan is estimated at more than VND3.084 billion, of which the national funding will be VND1.44 billion to industry promotion three projects and the local funding will be VND1.644 billion for 23 projects. (VEN) - In recent years, rural industry promotion activities in Quang Nam Province have been vastly improved, creating jobs for thousands of workers and contributing significantly to the local new rural area construction program. (VEN) - To deal with disagreements over the yarn-forward rule of origin in negotiations on the Trans-Pacific Partnership Agreement (TPP), the US has proposed a short-supply list for Vietnam. This was considered as a flexible solution that would loosen the rule of origin so that Vietnamese textile and garment exports could benefit from the TPP. (VEN) - The Japan External Trade Organization (JETRO) in Ho Chi Minh City Chief Executive Officer Hirotaka Yasuzumi talked about Vietnam’s support industries in an interview with Vietnam Economic News’ Thanh Thanh. (VEN) - The Hanoi Electricity Corporation (EVN Hanoi) has prioritized construction and upgrading of rural and mountainous power grids to serve the needs of economic development in accordance with government and Hanoi’s People’s Committee policies on boosting power supply to rural and mountainous areas.